Bake the cake as directed on the box, using a 9-by-13 inch cake pan. Let the cake cool completely. Crumble the cooled cake into a large mixing bowl. The easiest way to do this is with your hands; simply cut the cake into four even sections then remove one section, break it in half and rub the two pieces together over the mixing bowl. Be sure to crumble any large pieces that break off. You can use a fork or even a whisk to break up the larger pieces, just be sure that the cake crumbles are a fine in texture when complete. Lumps are bad for cake balls. Add 3/4 of the container of frosting to the crumbled cake – try to not add more or less, as more makes them too moist and less makes it hard to keep the balls intact. Keep mixing until the frosting is fully adsorbed into the cake and is no longer visible. Your cake mix should now be moist enough to roll into 1.5 inch balls and still hold the shape; after rolling each ball by hand, place them on a wax paper-covered baking sheet. Cover the baking sheet with plastic wrap and chill for several hours in the refrigerator, OR place in the freezer for 15-20 minutes. The balls should be firm, but not frozen. If using the freezer method (which I like because it is faster), move the baking sheets over to the refrigerator after the allotted time in the freezer – obviously keeping them at room temperature for very long will negate what you just did with the freezer. Place the candy coating (aka candy melts) in a deep, microwave-safe plastic bowl. These bowls make it easier for dipping and they are cooler to the touch after having been microwaved. I typically only melt one bag (12 oz.) at a time – it understandably begins to harden after a period of time so you don’t want to make too much. Melt the candy coating according to the instructions on the package – i.e. microwave on 50% power for 30 seconds at a time, stirring well in between. Keep doing this until you have a lump-free liquid coating – don’t overheat the coating, as it will begin to thicken and become unusable. 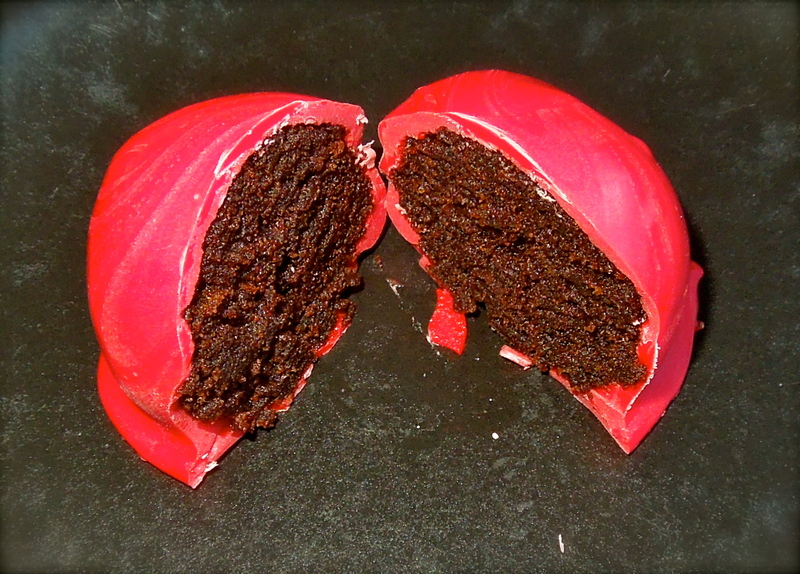 Tip: Sometimes your candy coating will be too thick, making it harder to dip your cake balls – darker-colored coating sometimes have this problem. An easy way to thin the coating is to add a teaspoon of shortening or vegetable oil to the candy coating; keep stirring until fully melted. Add more as needed until the coating is fluid enough to work with easily. Note – I have not actually had to do this yet, so I’m not sure how often thinning is required (I’m guessing not very). Now we’re ready to coat some cake balls! Take only a few cake balls out of the fridge at a time to work with. Place one ball into the coating, spooning coating over uncovered areas when necessary, and lift out the cake ball with your spoon. Hold the spoon over the bowl and tap the handle of the spoon so extra coating will drip off back into the bowl; this also helps in creating a smooth surface on the cake ball itself. Gently transfer the cake ball by on to the second wax paper-covered baking sheet by letting it slide right off the spoon. Some coating may pool around the base of the cake ball on the wax paper – to remove, simply use a toothpick and draw a line around the base of the cake ball before the coating sets. You can also break off any unwanted coating after it sets. If adding sprinkles or other general decorations, add to the top of the cake ball before the coating sets. If you have extra candy coating left over, pour it into a resealable plastic bag (cut a small hole in the corner to create a piping bag) or plastic squeeze bottle (I recommend Wilton brand squeeze bottles) and drizzle it over the tops of each cake ball in a zig-zag motion to decorate. 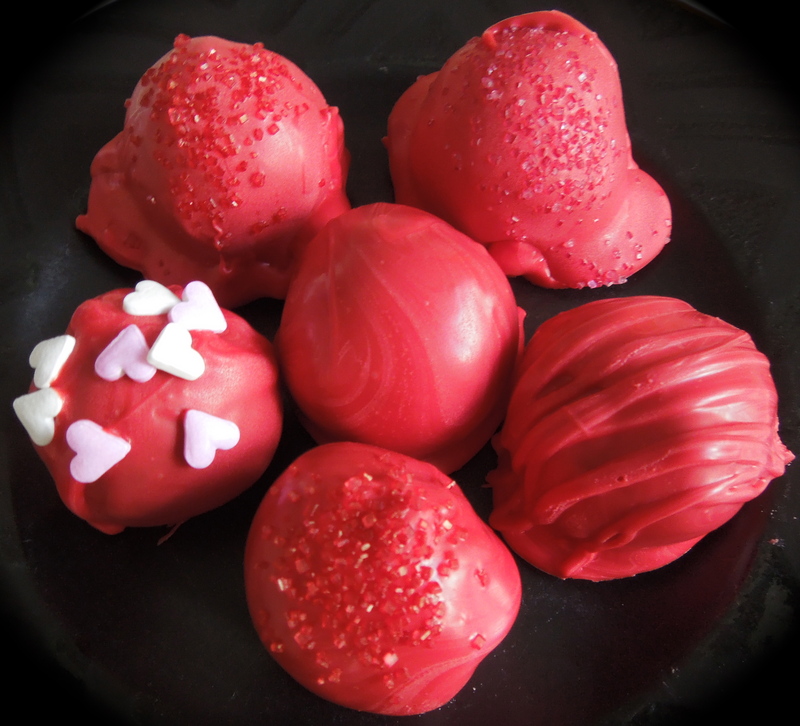 Cake balls can be stored in an airtight container or in the refrigerator for several days. Tip: If you don’t need or want to make 48 cake balls, just divide the sheet cake in quarters and use the appropriately reduced amount of frosting and candy coating. Each quarter of the cake makes about 12 cake balls. You can freeze the remaining cake for later use.